When you’re transferring your business videos and sharing them with your partners, it is important that you’re able to do so efficiently. In particular the two areas that you need to pay close attention to are the format and file size. As far as the format of your business videos are concerned, you will have to make sure that they are compatible with the device or platform of the person who is receiving them. At the same time the file size should also be compressed, mostly so that it can be transferred more easily and if you’re emailing the video then it needs to fit in the maximum attachment size that is permitted. Dealing with both those areas may seem a bit tricky at first glance, however all that you really need is Movavi Video Converter. It can be used both to convert your videos as well as act as video compression software too – at the same time if need be. To start converting your videos to a new format, all you need to do is add them to the software, select the format that you want, and click the ‘Convert’ button. If you’d prefer you could even pick a preset for the device or platform that you’re using, and let Movavi Video Converter automatically select the ideal format and video settings on your behalf. On the other hand to compress your business videos you could adjust the codec to one that is more compression friendly and tweak the other video settings such as the resolution, bit rate and frame rate. Frankly speaking however, the easiest way to compress your videos using Movavi Video Converter is by simply setting the desired output file size. That way you will let you software know how small you want your business video to turn out, and it can make adjustments accordingly. Performing both these tasks is so straightforward with Movavi Video Converter – and the same also applies to its other features. As you start to use it you’ll realize that it can also convert audio and video files, create animated GIFs from video clips, extract audio tracks and save them separately, and grab screenshots directly from videos. If you want you could also use it to enhance your videos, cut and combine video segments and edit them in various other ways. Simply put, preparing your business videos as well as any other sort of media files so that they are easy to share with your partners will be a walk in the park with Movavi Video Converter. It is able to handle all the tasks that are normally required for businesses – and then some. Nice info thank you for sharing..
1- Click on the ‘Add Video’ button and select the business video that you want to convert and compress. 2- Open up the ‘Convert to’ list and choose a format or select one of the presets that are tailored to specific devices to automatically use the ideal video format and settings accordingly. 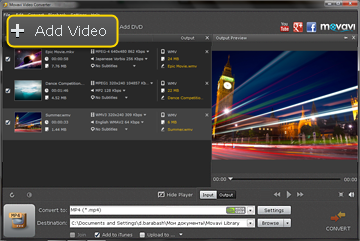 3- Assuming you want to compress the video, click on the size value in the ‘Output’ column and adjust the ‘Quality’ and ‘Resolution’ sliders until you arrive at the file size that you desire. 5- Click ‘Convert’ to convert and compress your video. Полезный и актуальный материал, нужный многим и в разное время. Nice info thank you for sharing. Thanks for your nice article. It works well.